The company has increased dividends for 4 years in a row, since it initiated a quarterly dividend in 2012 at roughly 38 cents/share. The last dividend increase was in April 2016, when the company raised its quarterly dividend by 9.60% to 57 cents/share. After the latest string of dividend increases, many investors are wondering if Apple can become the next dividend growth darling to fill in their portfolios at a lower valuation than many other companies. The company is also working its way through a massive multi-billion dollars authorized share buyback plan, which could shrink the number of shares outstanding by a quarter. As a result of many innovative products that Apple has introduced, it is sitting on close to $231 billion in cash and cash investments and long-term investments. This is offset by a long-term debt of 68.9 billion. The net effect of that represents close to 26% of Apple's stock market capitalization. The downside is that the vast majority of Apple's cash hoard is stashed abroad. This is also due to the fact that a little less than 2/3rds of its sales are coming from outside the US. Due to the onerous nature of US tax laws, US corporations are taxed on their worldwide income. However, as long as they keep foreign earnings abroad, they do not need to pay corporate taxes on income, which can run up as high as 35%. This is why companies like Apple keep their earnings abroad, and instead access domestic debt markets as a way to use that liquidity that is trapped overseas. It is cheaper for Apple to take debt and pay 1%/year on it, rather than pay a 35% tax on net income earned overseas if it chooses to repatriate it to the US. According to reports I have been reading, Apple now has a brand which is supposedly more valuable than that of Coca-Cola. To be honest, I am not a big fan of Apple as an investment. The reason is that I guess I just cannot forecast whether earnings per share will be sustainable over next 5 - 10 years, or they will plateau and go down. The future value of the business 15 - 20 years from now will be largely driven out of the profits that will be generated in 15 - 20 years. Given the competitive nature of the technology industry, and the rapid product obsolescence, it is more difficult to determine the sustainability of Apple's earnings. Currently, almost 2/3 rds of revenues are derived from sales of iPhones, while 10% of revenues are derived from the sale of iPads. The smartphone and the tablet were product categories that existed before, but Apple essentially created and invigorated with its product launches. Sales of Macs accounted for 11% of revenues and the rest is from services and other hardware. I do not know if iPhone/iPad next iWhatever will keep selling. Will people keep upgrading every few years, and pay a premium for features that are available elsewhere? This is an issue to think about, because products that are not as hot, have a steep declining curve of sales. I came to this idea after observing sales of iPod's over the years. It is true that iPod sales were cannibalized by the iPhone. However, if iPhone or iPad sales are affected by an external threat, we may see a decline in sales in corresponding proportions. If a product that accounts for 2/3rds of revenues is not so hot anymore, the company may have some problems at hand, especially if it fails to energize its consumers with new offerings, such as iWatches for example. So far, sales of iPhones have been going strong. 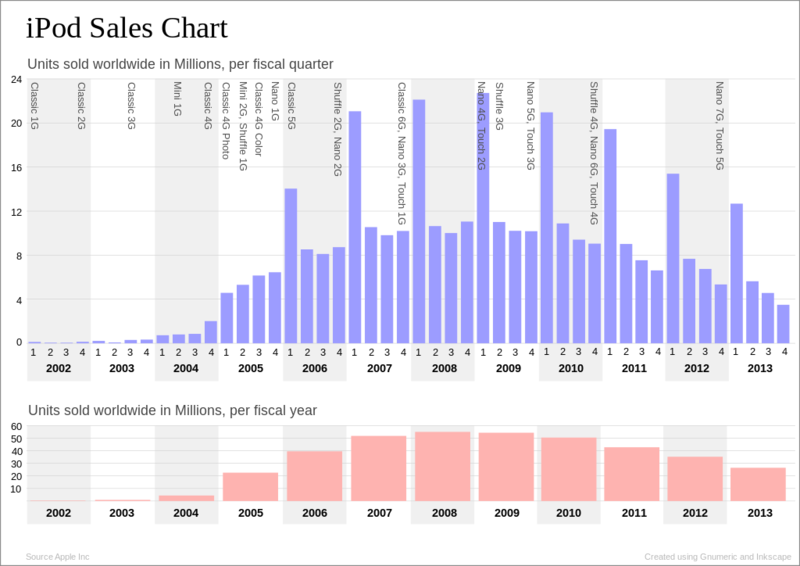 However, according to this website, this year could be the first drop in sales ever. It was the rage with PC's, where corporations upgrade every 3 - 5 years or so, which resulted in recurring revenues.. However. now tablets are eating PC's lunch. And honestly, is the iPad/iPhone something that is much different compared to say Samsung/anything that is Android? Everyone is trying to create an ecosystem, but then if you have changes in technology, would that ecosystem survive? 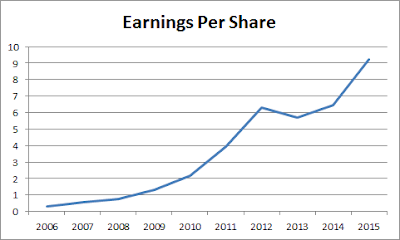 I am also looking at Blackberry, which generated $6.24 in EPS for year ended Feb 2011. The company also had spent a couple billion buying back stock at a P/E below 10. Remember all those managers that were addicted to their "crackberries"a few years ago? What are they using now to check work email? The steep decline in sales for Blackberries between 2007 - 2013 is just something that gives me a pause, before going for Apple. I am also thinking of the Motorola RAZR in 2005- 2006.. And also thinking about Sony, which is synonymous with quality for me and many others for the past 25 - 30 years. Now Sony (SNE) makes its profits primarily from its financial operations.. Currently, the stock is cheap, as it sells for 13.70 times forward earnings, and yields 2%. Out of $618 billion in market cap, you also have some downside protection in terms of almost 1/4 of the market cap being in a net cash position on Balance Sheet. So if you have confidence in Apple being able to roll out new products/services and generate high margins and high earnings for foreseeable future, then it might be a good hold for you. If you also get something like a valuation expansion, you could probably do pretty well for yourself as well. And in the meantime, you will likely be paid a nice growing dividend, while you are waiting. If earnings start dropping from here however, you may see losses in capital, and the dividend will be in danger. The low P/E ratio reflects the overall bearishness on the company's ability to maintain profits going forward, given the intensely competitive nature of the smartphone market. 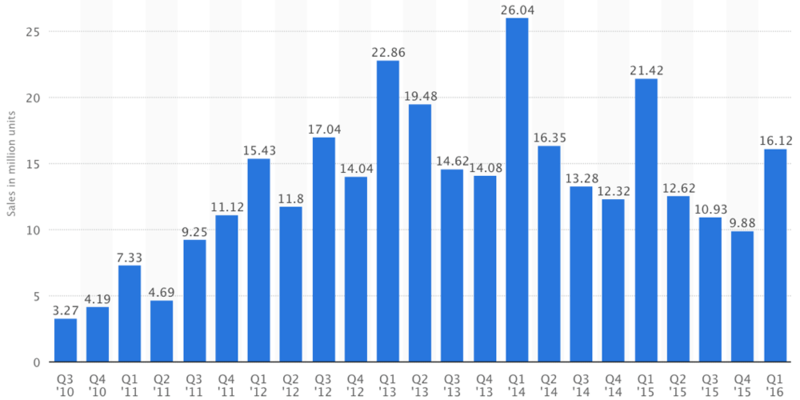 Sales of smartphones have accounted for a large part of Apple's growth over the past five years. Competition from Samsung, LG, and HTC has eroded Apple's market share. 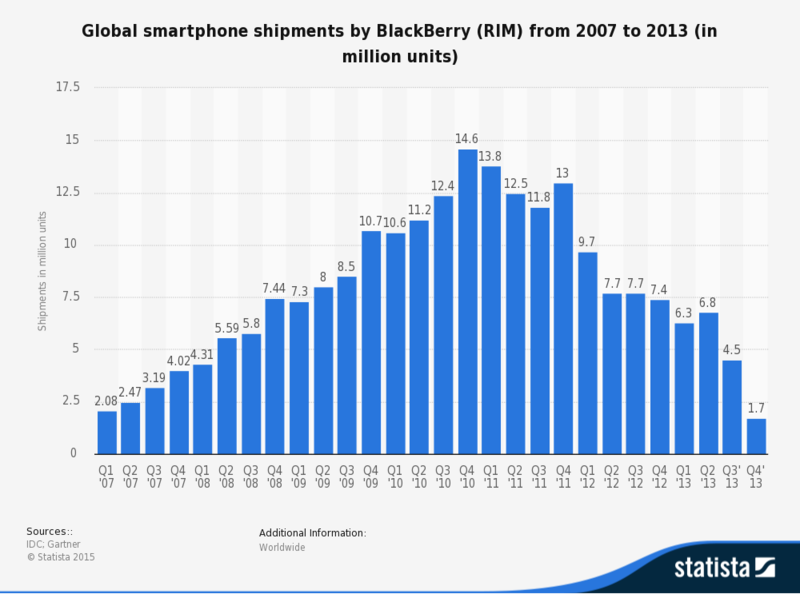 On the other hand, Apple has been the dominant leader in smartphones. This is evident by the high amount of profits earned, high margins, and high customer loyalty. iPhone’s are perceived as quality products, which is why people are willing to pay a premium for them. The company’s other competitors have not done as well. More recently, Samsung’s newest phone has been having some issues, which have led to it halting sales to the recent model. This could be advantageous to Apple in the short-run, assuming that its latest phones do not catch on fire either. If the design flaw is due to a Samsung related issue, then Apple will clearly benefit. If the design flaw is due to an issue related to a supplier however, or a flaw that is copied from Apple, then Apple may not benefit as much from this fiasco. The issue with Apple is that if there is something wrong with the iPhone, and a product has to be recalled, it would really affect the bottom line given the fact that it accounts for 2/3rds of sales. So if you are an Apple investor, I am hopeful that the quality control is up to par. So my conclusion is that the world of technology is unpredictable. While some brand affinity exists, the rate of innovation is high enough to warrant consumers to switch to another competitor. I know that Apple is trying to build a moat. The company makes long-term contracts with wireless carriers, which ask for a certain commitment on phones sold. The company also has a group of customers who are very excited about its products, because they are perceived as cool, and as a great quality. The company doesn't compete on price, and has maintained large margins. Of course, if consumers are not excited about the next iPhone product, they will stop upgrading. Without continued innovation, and staying on top of all trends in technology, people will not be interested in upgrading to a new Apple phone if the technology is viewed as old school. That of course doesn't mean that the company cannot earn billions of dollars in profits until the ultimate demise of the iPhone. It just means that forecasting whether the phones/tablets/igadgets will still be sold at a premium price five or ten years from now due to changes in technology and consumer tastes. I have a much higher degree of certainty that a decade from now people will be shaving using Gillette products. As a rule, I try not to invest in a business where I can expect a substantial amount of disruption that could jeopardize sales and profits. If I cannot believe that the business will be around in 10 - 20 years, making a sustainable profit during that period, then I cannot really buy this business. I am hesitant because I do not see it as a recurring product you would buy over and over. For example, with Nike (NKE), I am not sure technology will easily disrupt the way you put shoes on. If there is change in shoes, it will be very slow and gradual, which would allow Nike to respond. There are significant improvements along the way, and the company invests to be the best brand, but I don't think technology plays same role as say Apple. I could be wrong, or I could be right. Let's circle back on this one in 10 years. Since this business is outside my circle of competence, I will not invest in Apple ( though I do own it indirectly through the mutual funds I own in my 401 K). 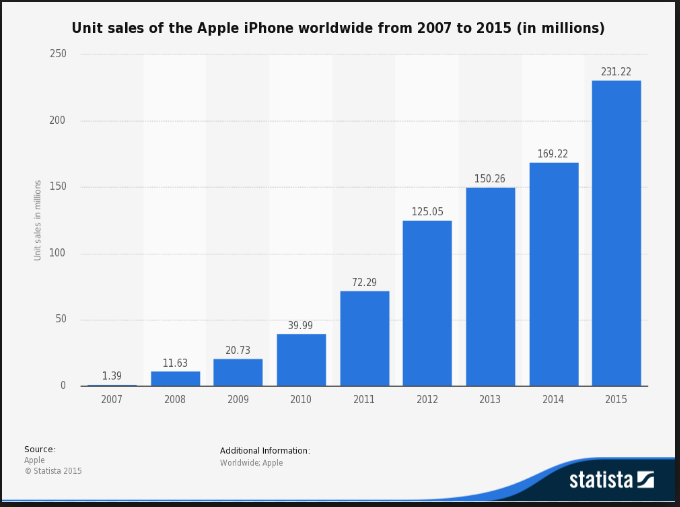 - Should dividend investors care about Apple’s Dividend?